In the not-too-distant future, people may have a simple device that monitors and reports health indicators, identifies even trace amounts of undesirable biomarkers in the blood or saliva and serves as an early warning system for diseases. This is one of the promises of personalized medicine. 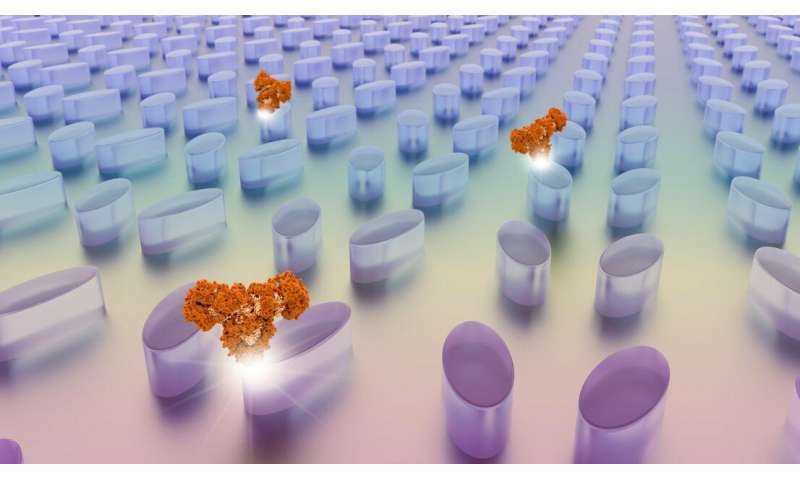 Such a technological revolution may be one step closer thanks to a powerful tool developed by researchers at EPFL's BioNanoPhotonic Systems (BIOS) Laboratory. It consists of an ultra-thin, miniaturized optical chip coupled with a standard CMOS camera and powered by image analysis, which counts biomolecules individually in a sample and determines their location. Their research has been published in Nature Photonics. This technology is based on metasurfaces, a recent development in the field of photonics. Metasurfaces are sheets of artificial materials covered in millions of nano-sized elements arranged in a special way. At a certain frequency, these elements are able to squeeze light into extremely small volumes, creating ultrasensitive optical hotspots. By shining colored lights of different colors on the metasurface and taking a picture each time with a CMOS camera, the researchers are able to count the number of molecules in a sample and learn exactly what is happening on the sensor chip. "We then use smart data science tools to analyze the millions of CMOS pixels obtained through this process and identify trends," says Filiz Yesilkoy, the article's first author. "We've demonstrated that we can detect and image not just individual biomolecules at the hotspots, but even a single graphene sheet that's only one atom thick." Taking their work one step further, the researchers developed a second version of their system, with metasurfaces programmed to resonate at different wavelengths in different regions. "This technique is simpler, yet it is also less precise in locating the molecules," says Eduardo R. Arvelo, one of the article's co-authors. Hatice Altug, who runs the BIOS lab and leads the project at the School of Engineering, sees immense potential in the field of optics. "Light possesses many attributes – such as intensity, phase and polarization – and is capable of traversing space. This means that optical sensors could play a major role in addressing future challenges – particularly in personalized medicine."